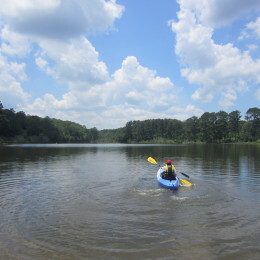 Enjoy a memorable afternoon with a rented bike, kayak, or paddleboard at Panola Mountain State Park. Feel the wind in your hair as you glide over the AMP or slow down with a paddle through the reflective waters of Alexander Lakes. Too much fun for one day? Rent a campsite and pick up where you left off in the morning! Ready to reserve your ride? Call Panola Mountain State Park: (770) 389-7801. Good to know: Adult bikes come in 6 sizes to fit any rider and helmets are included. Available: Alexander Lakes: 4835 Flat Bridge Road, Stockbridge, GA 30281. Saturday and Sunday, 8:30 – 4:30pm. Available: Rent your site at the Nature Center: 2600 Hwy 155 SW, Stockbridge, GA 30281. Sites can be rented seven days a week and are located next to Scout Lake. Good to know: Each site has a tent pad, fire ring, picnic table, and a composting privy. Two tents can fit on each pad and leashed dogs are welcome.